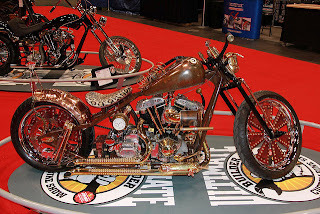 Copper Mike Cole of Gravesend Cycles booked his place at the 2012 AMD World Championship and took home a $3000 cash prize by winning the Freestyle class at the Ultimate Builder show in New York. Mike's bike "Steampunk", based on a 1973 Harley-Davidson Shovelhead, features a rebuilt engine with engraved heads and 10:1 compression and numerous re-purposed antique gauges and parts rebuilt into functional pieces. He built a hand clutch with an old Harley mouse trap. 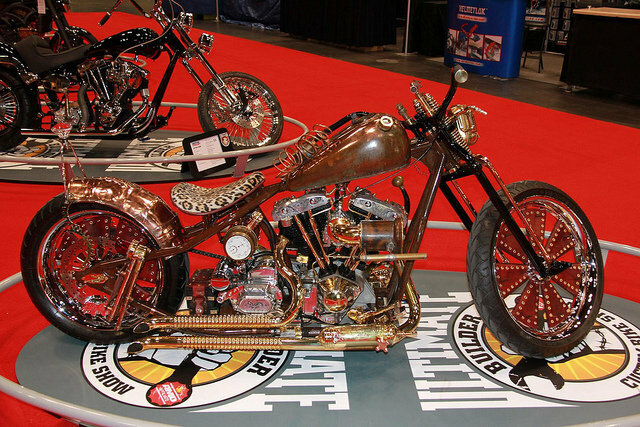 The bike is fabricated from equal parts copper and brass. Runner-up was Stu Spiegel of Stu's Auto and Cycle Service, with George Stinsman of Chaos Cycle third with "Model 33". The Modified Harley-Davidson class was won by Steve Iacona of Iacona Custom Cycles with "Challenger", his 2011 Modified Harley World Championship runner-up. Roman Levin of FOH Cycle Fab won Performance Custom for the second year running, this year with "FOH Cafe", a 2002 Suzuki, and the Retro Mod class was won by Fred Montalto with "Spitshine", a 1960 Harley-Davidson Panhead.